the dualist framework of vision/mind touch/body, the visitors are offered the opportunity to experience two 'places' at once and practice the continuity of physicality and virtuality. computer users outside the room. 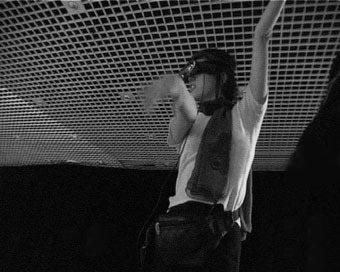 The glasses function as an intermediate apparatus between the participants' 'free motion' and control. Is it possible to pass from the self-possessed body to the collective-possessed one? Or further, from "body - body" to "body-system" pleasure (i.e. collective pleasure co-modeled with apparatuses)? The avatars' instructions interlace with the physical contact improvisation providing an unstable motion equilibrium. Perfromance by the dancers Mageli Buono and Qwenddinz de la Quimaude, Grimaldi Forum, December 02. Audience perfromance, Grimaldi Forum, December 02. Pleasure Machine2/Blind Date is a multi-user choreographic environment that experiments estranging our common way of communicating, getting us acquainted with the complex mediatized interactive potential of the digital technologies of our time. As a metaphor for the struggle to overcome the dualist framework of vision/mind touch/body, the visitors are offered the opportunity to experience two 'places' at once and practice the continuity of physicality and virtuality. Two persons meet/date in a room completely blind to one another other if not for two avatars of themselves seen through their VR glasses manipulated by two computer users outside the room. The glasses function as an intermediate apparatus between the participants' 'free motion' and control. Is it possible to pass from the self-possessed body to the collective-possessed one? Or further, from "body - body" to "body-system" pleasure (i.e. collective pleasure co-modeled with apparatuses)? The avatars' instructions interlace with the physical contact improvisation providing unstable motion equilibrium. This project challenges the earlier interactive performance in various crucial ways. Whereas before there was only a one-to-one mediated interaction between a performer and a user, with the duplication of the setting two or more simultaneous and differently mediated interactions occur, and the visitors are to perform as well. 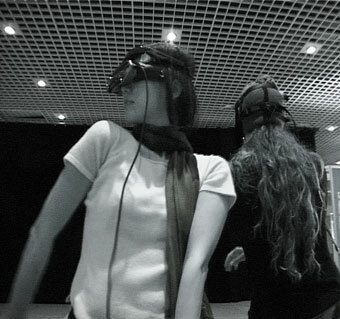 The performance aims at stimulating the visitors to more fully engage in the physical contact interaction, and negotiate between this and simultaneous visual/movement communication with the users at the computer. It addresses the situation of being in two places at once as a metaphor for the struggle to overcome the dualist framework of vision/mind touch/body. Depending on the visitors it has the potential for having different interpretations as well as degrees of involvement. The graphic below is a simplified version of the multi-user environment. It requires an empty closed space or a delimited area big enough for two people to move without bumping into each other but small enough to generate that possibility as well. 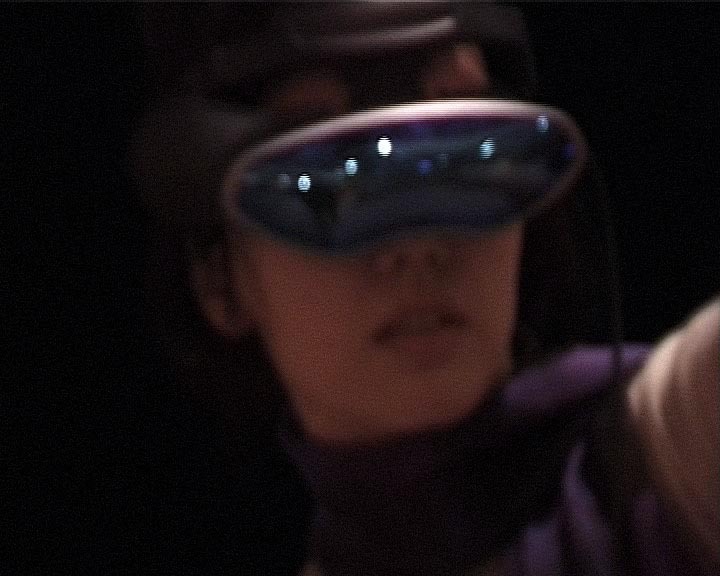 The 2 performers (or visitors) will wear a par of 3d glasses each wired to 2 pcs, which will be connected to 2 other pcs outside of the performance space from which the 2 users interface with the performers. The difficulty is that although there is a previous work it is substantially different, but at this point only possible to conceptualize and antecipate its actualization. communicating and getting acquainted and familiar with a more complex mediated interactive characteristic of the technologies of our time. 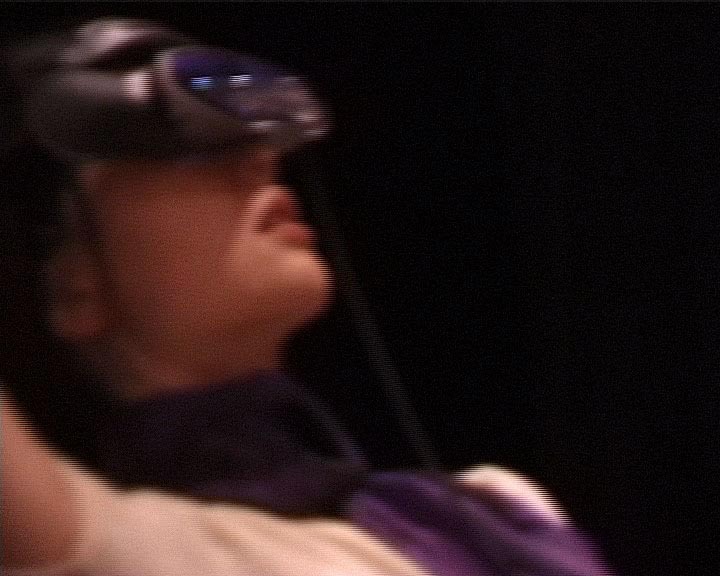 Thus PM2/Blind Date explores the issue of continuity between 'real' and 'virtual' embodiments, through the merge of physical and virtual mediated contacts using contact improvisation and virtual reality interaction. For the 'live' person, will the virtual dancer feel more 'real' than the 'real' person touched? The performance will be a sofisticate version of playing the installation/a demonstration, which would be then open to the public to perform. The music will be part of the software program and the interactions with the avatar will simultaneously produce real time random music. The idea is to explore mediated movement communication between the 'spectators' and ÔperformersÕ through avatars. The question is not so much what will the performers do, but what are viewers' conception of the performer and the work, and how can the performer challenge it. Or the other way around: how can the performer be challenged by the 'spectator'? Although in the present work the 'viewer' is only pushing-buttons and the performer performing, the way the work is thought to be developed implies the participation of the 'viewer' as performer as well, thus becoming a way for people to communicate/think through movement. The development of the project will implied further programming of the avatar's movement possibilities/variables in time and space by Nikitas M. Sgouros, as well as an improvisational choreographic structure for the interaction between the avatars and the physical performersÕ movement. Both elements will constitute a source of continuous input in a constant feedback loop/conversation between the participants. This way the work becomes a partnering between virtual and 'live' performers. 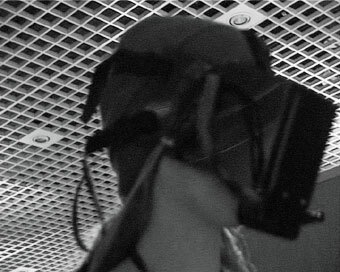 Vassilios Kokkas contribution was to construct a 'space division' for the video image inserted into the MAX MSP program which is connected to his polyphonic music program called 'Slicing Polyphony'.